Air Culinaire Worldwide® menus are continually evolving and our professionally-trained executive chefs possess a wide range of skills and experience that traverse the globe. While favorite classic items are available at all locations, we also have developed a wide array of menu items in the United States inspired by the flavors, local cultures and unique culinary trends found across the 50 states. 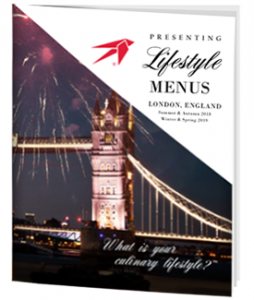 The United States Lifestyle Menus are available exclusively out of our kitchen locations throughout the United States. European Lifestyle Menus, available in locations serviced by our kitchens in Paris and London, have strong local culinary influences meshed with global flavor profiles found in distinct regions of those cities. Click on a location below to view available menus. I needed catering for an international trip arranged quickly. With one phone call to Air Culinaire Worldwide, it was covered with ease. Our Research and Development team, based in Florida, works around the clock to customize and enhance special proprietary menu items for you. We also can work with you to design and deploy a selection that best suits your clients’ tastes, while still maintaining our artisanal standards and freshness. Lifestyle Menus are available through the Air Culinaire Worldwide® kitchen locations listed above, to give you a taste of what our culinary teams can craft for your clients. For menu items supplied by our catering partners, please call your Air Culinaire Worldwide Network team at +1 (800) 247-2433 or +1 (813) 449-6000. We are ready to serve you the freshest and most flavorful menu from your point of departure. Everything we deliver is made from scratch and sourced from local farms and markets. This level of services means there is more work involved for preparing your in-flight catering, and the end results are worth it. We are redefining in-flight cuisine as you know it. Our cuisine is always prepared fresh and made specifically for you. Our team of local chefs specializing in private jet catering know where the best meat and produce come from, what the area specialties are, what is in season, and provide gourmet options to the more standard fare that is commonly offered. Our creative culinary team views each meal as an opportunity to demonstrate their attention to detail and taste. Our chefs start preparing very early in the morning. Well, it’s always morning somewhere and we operate globally – 24 hours a day, 7 days per week. During that time, we are creating extraordinary food that entices the mind and pleases the palate. It’s a collaborative atmosphere where great minds come together – yours included. Looking to add a special item to your dinner? Speak with one of our talented culinary professionals to integrate a favorite ingredient into one of our dishes. You will be amazed what is possible. The best way to categorize our cuisine is “From Scratch, Small Batch” cooking. Our food is made specifically for your order by our skilled team of chefs and garde manger experts with precise execution. This approach is crucial to the character and flavor for each element that a dish contains. We want every meal to be a memorable experience. We work with local suppliers to offer you the most flavorful components and freshest products available, including local specialties. Some of the best dishes are simple dishes made well, using the freshest ingredients and spices from the region. Food from the local market will always be better than food brought in from hundreds of miles away. We have the capability to create very sophisticated dishes, with minimal advanced notice. Additionally, we have a wide skill set that can accommodate almost any ethnic cuisine. In addition to your base menu choices, we invite you to try some of the chef’s regional menus to help enhance your personal dining experience. Perhaps something is missing from the menu that you wish was there. Let us know. We can make that happen for you. Whether you are looking for one of our flavorful signature dishes or something simple and clean, our chefs will handcraft a meal experience designed precisely for your needs. At Air Culinaire Worldwide, you will find a passion in our approach to cuisine and also in the people that create it. We want to exceed expectations on every aspect of every order. For some, passion towards food starts at a very young age – a family dinner table perhaps. Others may have begun to experience it after tasting something later in life that made them feel euphoric. While our chefs all started in different places, their dedication and excitement for cuisine eventually led them to Air Culinaire Worldwide. They aspire to excel in every aspect of the culinary arts. Cuisine embodies history and tradition with every mouthful, and can mean very different things from one person to another. Food can also elicit emotions because people indeed have a taste memory. It doesn’t have to be just a meal; it’s a catalyst. Food can and should be an experience. The family at Air Culinaire Worldwide cares very deeply about your entire experience. From concept to consumption, your clients’ dining experience is cultivated with the utmost attention to the appreciation and joy that food can provide. Let us show you. Our executive chefs received training at some of the most prestigious schools in the United States, such as the Culinary Institute of America and the New England Culinary Institute. They continually work with our research and development team to learn new skills and test new recipes you will love. Additionally, our chefs have hospitality backgrounds in world-renowned organizations like the Four Seasons, so they understand the meaning of first-class service. Rest assured that your order will be prepared with great care, specifically tailored for you. The best flavors are only as good as the ingredients. We source local fare from every region we serve and take advantage of the unique tastes and preparation techniques from the area. Your in-flight catering is handmade in small batches by our chefs or sourced at the best local venues available. Our client services team is available for you at any time, day or night, no matter your current time zone. Ordering is easy and is available via many options. Everything is managed through our proprietary order management platform, including integrations with flight planning software like PFM, Bart, Camp and FOS. Additionally, orders can be placed through our website, email, fax, or you can call a kitchen. We are dedicated to protecting the environment. It is – after all – where our fresh food comes from. That is why we are committed to taking steps to limit waste, reduce our carbon footprint and utilize local food purveyors and markets. It is part of our mission to provide an array of cuisine made by chefs in your area – not to bulk order or air freight items from thousands of miles away. The freshest flavors and textures come from food that travels a short distance to get to your plate, with farm-to-galley as the gold standard. We work with local farms and markets that have the same regard for quality, safety, purity and community-supported food cultivation as we do. That means reduced pesticides and chemical fertilizers, good soil management and nothing from mass-production factory farms. Whenever possible, we recycle used materials and make every attempt to use paper and plastic products that are compostable or biodegradable. We partner with like-minded distributors that believe in a reduced waste approach. Polluting trucks and other modes of transportation damage the environment. Whenever possible, we use vehicles that are environmentally-friendly. This includes hybrid, electric, flex fuel and other automobiles rated for reduced emissions.